Miami has picked up a commitment at a major position of need. Buford (Ga.) High three-star defensive tackle Jalar Holley went public with a pledge to the Hurricanes on Sunday after spending the weekend in Coral Gables for Mark Richt’s annual Paradise Camp which featured former defensive tackle Warren Sapp, former linebacker Jon Beason, former linebacker Jonathan Vilma, former offensive lineman Bryant McKinnie, former wide receiver Lamar Thomas, former defensive back Bennie Blades, and former running back Clinton Portis as guest coaches. Holley, who is listed as the nation’s No. 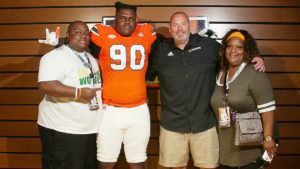 55 defensive tackle prospect on the industry-generated composite, picked UM over offers from Ole Miss, Auburn, South Carolina, Arkansas, Florida, Michigan State, Arizona State, Virginia Tech, Nebraska, Tennessee, Minnesota, Kansas State and Kentucky. Holley attends the same high school that new Miami defensive line coach Jess Simpson worked at for a number of years. The rising senior that his parents have a great relationship with Simpson, who coached his older brother for a few seasons. What stands out to Holley about Miami aside from Coach Simpson? Holley picked up an offer from UM back in late May after take an unofficial visit to campus in April. For a while it looked like he might be headed to the SEC to play football, but once it became clear that he had a spot at Miami things changed. 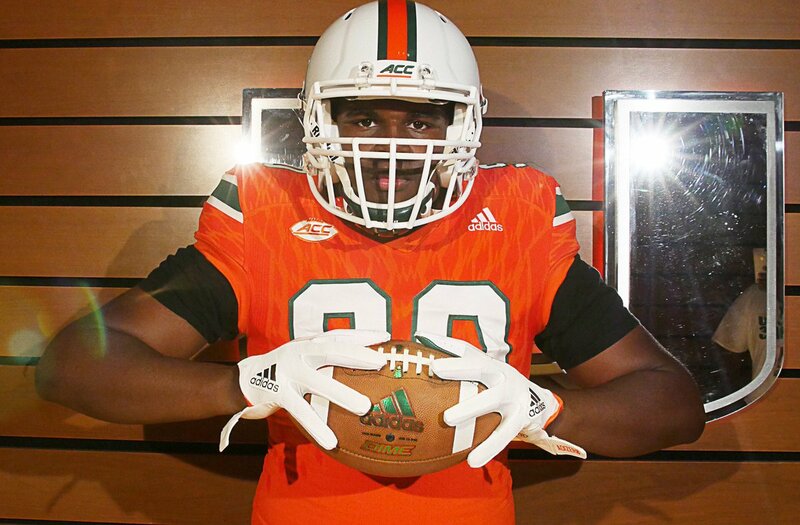 Holley (6-2, 280) becomes the fifth defensive lineman to commit to the Hurricanes this cycle joining Hollywood Chaminade-Madonna Prep three-star defneisve end Cam Williams, Vero Beach three-star defensive end Jahfari Harvey, Doral Academy Charter three-star defensive tackle Denzel Daxon and Fort Lauderdale St. Thomas Aquinas three-star defensive tackle Jason Munoz. He’s also commit the fourth prospect to give a verbal pledge to UM this weekend at Paradise Camp following the South Dade 2020 trio of Jonathan Denis, Keshawn Washington and Jaiden Francois announcements on Friday and Booker T. Washington 20201 defensive end Donell Harris’ decision to commit on Saturday.